Two teenage brothers have each been sentenced to eight years' youth custody for killing schoolboy Damilola Taylor. Danny and Rickie Preddie, aged 18 and 19, of Peckham, south London, were convicted of manslaughter in August. 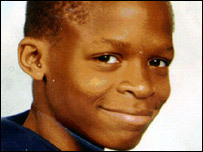 Damilola, 10, bled to death after being cut with a broken bottle in Peckham in 2000. The inquiry into his death has led to three trials and cost £16m. But Damilola's father, Richard, criticised the sentence saying it would do nothing to deter other criminals. Sentencing the brothers at the Old Bailey, Mr Justice Goldring said neither had shown any regret or remorse. 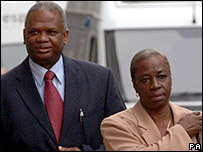 Addressing Damilola's parents, Richard and Gloria Taylor, the judge said the sentence may seem "inadequate" but that he had to take into account that the pair were only aged 12 and 13 at the time of the killing. He added that he hoped the sentence would reflect the public's concern about gangs bullying other children. But after the sentencing, Mr Taylor said the case represented a "catalogue of failures", adding: "Today's convictions will not bring back Damilola and we question whether these sentences will act as an appropriate deterrent to other potential criminals. "With the spate of recent stabbings and shootings by young people for whom carrying weapons has become an accepted norm, we believe Damilola's murder reflects a crisis within our communities that is now out of control." The judge sentenced the Preddies to eight years' youth custody, minus time already spent in custody - 523 days for Rickie and 330 for Danny. Mr Justice Goldring said: "No sentence can bring Damilola back. It may be that to Mr and Mrs Taylor, who throughout have conducted themselves with such dignity, the sentence will appear inadequate." The judge, who said there was evidence that Damilola had been bullied told the Preddies: "This was an attack by a gang on a young and vulnerable victim. "It must have been obvious, even to those as young as you, that to thrust a broken bottle at another person, albeit in the area of the lower thigh or leg, ran a risk of significant injury." Both raised their handcuffed hands to friends in the public gallery as they were led off to the cells. Nigerian-born Damilola had only been in the country a few months when he was found bleeding from a leg wound in a stairwell on a housing estate in Peckham in November 2000. It is thought he was attacked as he made his way home from an after-school club and was jabbed with a broken beer bottle. The long investigation included a much-criticised trial of four other youths in 2002 - all of whom were cleared. Earlier this year the Preddie brothers and a third defendant, Hassan Jihad, 20, went on trial for murder after new forensic evidence, apparently missed during the first investigation, was found. Mr Jihad was cleared of all charges, the Preddies were cleared of murder and assault but the jury failed to reach verdicts on the manslaughter charge. The brothers were arrested a few days after Damilola was killed but were released without charge. They were re-arrested last year when the blood and fibres from Damilola were found on their clothing. The jury heard they had convictions for robbery, some at knifepoint, and witnesses claimed the brothers had confessed to the killing. A friend of Damilola told police he thought Danny Preddie may have come off worse in a fight with Damilola, who had broken his gold chain.